In today's blog we take a look at what Taylor's rule suggests South Africa's Repurchase Rate (Repo Rate) should be at, based on the latest GDP numbers, inflation figures and production capacity numbers. For those that do not know the Repo rate is the rate at which the Reserve Bank borrows money to retail banks, they (the retail banks) then add another 350basis points on top of the repo rate and this is what is commonly referred to as the prime lending rate. So who is Taylor and why does he have a say in where interest rates should be at? While Taylor's rule should not be accepted as the be all and end all of where interest rates should be at, it does provide a good indication of where rates should be at based on a set of economic data supplied into the Taylor's rule model. 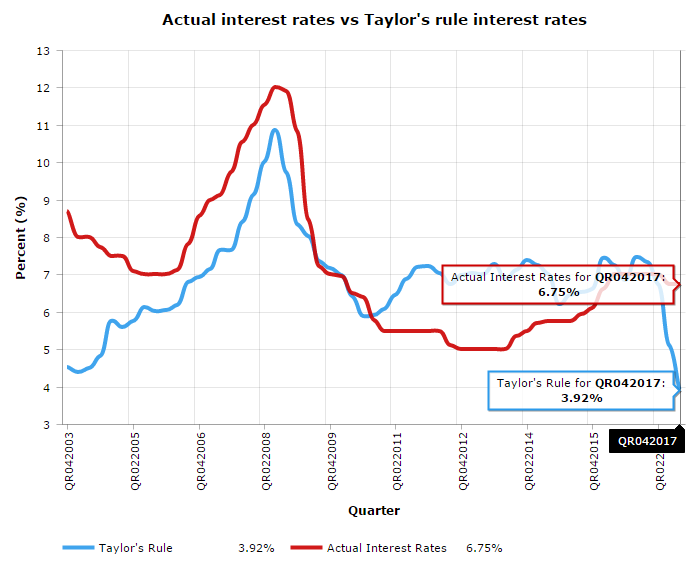 The graphic below shows the quarterly Actual Interest Rates (Repo Rate) and the quarterly Interest Rat as suggested by Taylor's rule. The graphic above shows a very sharp decline in the predicted interest rates based on the economic data of South Africa up to end of 2017. The main reason for this is the strong decline in the overall levels of inflation in the last number of quarters, paired with lackluster economic growth and production numbers in South Africa. While we do not expect the South African Reserve Bank (SARB) Monetary Policy Committee (MPC) to cut interests rates to the levels suggested by Taylor's rule we firmly believe that there is room and arguments for a interest rate cut at their next MPC meeting. Essentially the lower interest rates are predicted by Taylor as there is little chance of Demand Push Inflation (inflation caused by increased demand, where greater demand leads to lower supplies which leads to prices increasing) leading to higher levels of inflation, as demand is pretty subdued as shown by the weak economic growth numbers for South Africa. Lower interest rates would lead to more money available for consumers to spend on goods and services instead of servicing debt. And this increased money available could lead to increased demand and in turn increased levels of inflation. But the current rate of inflation of 4% for February 2018 as published by Statistics South Africa, is absolutely nothing to worry about for the South African Reserve Bank (SARB) as their inflation target is inflation between 3% and 6%, and the current level of inflation is very close to the lower boundary of SARB's inflation target. So there is certainly room for cutting interest rates to help struggling consumers out a bit. So the biggest question is while the SARB MPC decide to cut interest rates at the end of their MPC meetings from 26-28 March 2018? Well would surely like to see them cut rates by 50 basis points as inflation is currently well within the target band and there is more than enough scope for SARB's MPC to provide some relief to struggling consumers in South Africa.